Meanwhile, William Connelly has been lauded with offers of life-time tickets from Hill Top Hoods, basketballer Ben Simmons dubbing him an "Australian legend", and a mural of the incident appearing on Melbourne's Hosier Lane with the hashtag #eggboy. 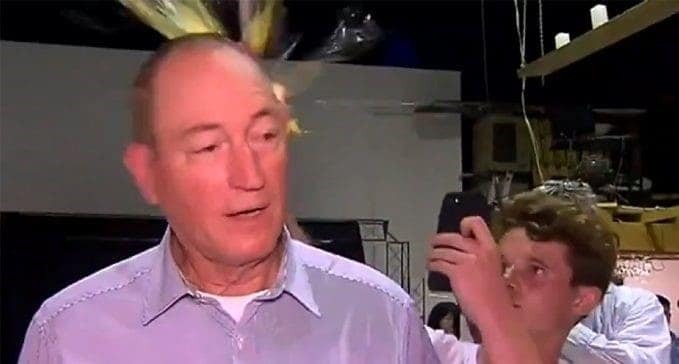 Senator Fraser Anning remains unrepentant about his confrontation with the so-called ‘Eggboy’, saying the teenager who smashed an egg on his head deserved the slap he gave him. “He got a slap across the face, which is what his mother should have given him long ago,” Anning said on Monday. In a video which has gained global attention 17-year-old William Connolly smashed a raw egg on Anning’s head while the right-wing Queensland senator was talking to media on Saturday. The senator immediately retaliates, striking the Connolly twice before several men from his entourage forcefully restrain the boy. Connolly was apparently acting in response to an inflammatory statement published by Anning following Friday’s mass murder terror incident in Christchurch, New Zealand, where 50 Muslims were killed by a right-wing extremist from Australia. In the statement, Anning effectively lays the blame for the victims’ deaths on themselves, saying the “real cause of bloodshed on New Zealand streets today is the immigration program which allowed Muslim fanatics to migrate to New Zealand in the first place”. “Whilst this kind of violent vigilantism can never be justified, what it highlights is the growing fear within our community, both in Australia and New Zealand, of the increasing Muslim presence,” he said in the statement which was issued on Australian parliamentary letterhead. The senator’s statement has been broadly and roundly condemned, leading to a bi-partisan move to censure him in parliament and a petition signed by over a million Australians to have him removed from the legislature. Meanwhile, Connelly has been lauded with offers of life-time tickets from hip hop band Hill Top Hoods, basketballer Ben Simmons dubbing the 17-year-old an “Australian legend”, and a mural of the incident appearing on Melbourne’s Hosier Lane with the hashtag #eggboy. His Instagram account has also since swollen to over half a million followers. Anning has not apologised for his statement nor for hitting Connelly which he maintains was an act of self defence.